The Decor Diaries Part 3: The One! So I’ve not exactly blogged on why and how I chose Anggun Decor as the official decor vendor for the wedding at my side. I previously blogged in The Decor Diaries Part 1 and The Decor Diaries 2 regarding my decor dilemma. I mentioned how when it comes to decor, I place great importance on drapes and fresh flowers. Initially, I shortlisted ComelMolek and Anggun Decor before finally making my decision. I decided on Anggun Decor simply because it’s THE ONLY wedding vendor I’ve had my eyes on since I started this whole wedding project. I mean, sure, I did like decor from other companies like Jentayu and even Mariah & Sham (they didn’t reply me!) since they offer bespoke wedding decor. There was even this one time when I e-mailed a Malaysian company because their decor is just amaaazing but when I got the quotation, kirim salam sudah. Okay back to my Anggun Decor (AD) story. Despite other companies offering equally jaw-dropping wedding decor, I realised I keep coming back to Anggun. They may not update their IG as often as I’d like them to but it doesn’t really matter because somehow, my parents and I keep attending weddings by AD. So naturally, we tend to gravitate towards AD because we see their work first hand and instantly fell in love over and over again. The best thing is that their office is in Bukit Batok which is veryyyyy near to my workplace. I am very pemalas so if wedding companies are located in the East, I usually just get Z to meet them or make an online agreement for deposit hehe. But since this is one of my major vendors, I HAVE to meet them. And we weren’t disappointed. Kak Nyta is very sweet and hospitable when my parents and I came for the appointment. I could see that my parents were already very comfortable with them and even though I’m the one paying for it, I find that it’s important for my parents to be senang hati also lah. I also caught a glimpse of the materials and items they used and they have quite a wide variety. I can’t wait!!! Let me share some photos with you girls! So pretty right? The first three are their Open Concept Dais (need to pay a little bit more) while the last is from their Basic Decor ( I think). I signed up for the Basic Decor Package first but I think I probably will top up to get the Open Concept Dais hehehehe. Oh and AD just did one recently at Begonia Ballroom and OHMYGOODNESS!!!! It’s so beautiful and just like a Malaysian wedding! So lawa!!!!!! Hehehe I’m getting more impatient just by seeing all these pretty photos! What’s for sure – I know I made the right choice by getting AD and inshaAllah everything goes well! The Decor Diaries Part 1: What a Woe! First and foremost, I want to thank all those who have commented on previous post and also my friends who dropped me a messaged just to tell me it’s okay to do my research and book appointments with vendors this early. I feel much better now! 🙂 So today, I want to talk about wedding decor. I know some people won’t consider the wedding decor as something of top priority – my mom is definitely one of them. But I’m not those people. From the very beginning when Z and I started planning for the wedding, I knew very well that the wedding decor would be of significance to me. I’ve always loved attending weddings and admiring the beautiful array of fresh flowers, dais and the flowing drapes. Oh, gosh, DRAPES. My weakness has got to be drapes, especially when they are hung from wall to wall, with full ceiling coverage. Heck, I can just browse through Facebook, Instagram and Pinterest for hours looking at beautiful drapes. I cannot get enough of drapes. Can’t you tell? Hehe. But alas, drapes come at a hefty price tag. As heavy as the drapes themselves. My heart sinks each time I analyze the catalogues sent by the vendors. I wasn’t sure if it was going to be worth it at all. I decided that it wasn’t after a while, and I was fine settling for the basic decor with no additional, melampau, drapes. Well, I thought I was quite settled by that decision already. Apparently not. Me being the fickle-minded person that I am, I kept swaying from wanting drapes and not caring about drapes. I think my mom got really fed-up that she stopped me from browsing through more pictures. Hehe. I admit, this whole decor thing has caused me so much distress that I’ve even decided to have my own series just for decor, The Decor Diaries. In this part of the series, I am going to share with you girls the wedding decor companies that I have shortlisted for my wedding. I have set up appointments with some of these companies as of now so we’ll see how it goes when I’ve made my decision. And yes, I’ve decided to go for drapes and the shizz. Now, who doesn’t know of Jentayu right? I love how they pay so much attention to details. To be honest, they are not so big on drapes BUT they have fresh flowers and fresh flowers do just as well for me. Besides, it’s Jentayu, hello? To me, Anggun Decor has got to be THE vendor that you have to go to if you are crazy for drapes. I am so crazily in love with their decor. I mean, how can I not?? Every single time I attend a wedding that has the privilege to be graced by Anggun Decor, I will hyperventilate. No kidding. Just look at the photo of this very charming open concept dais! 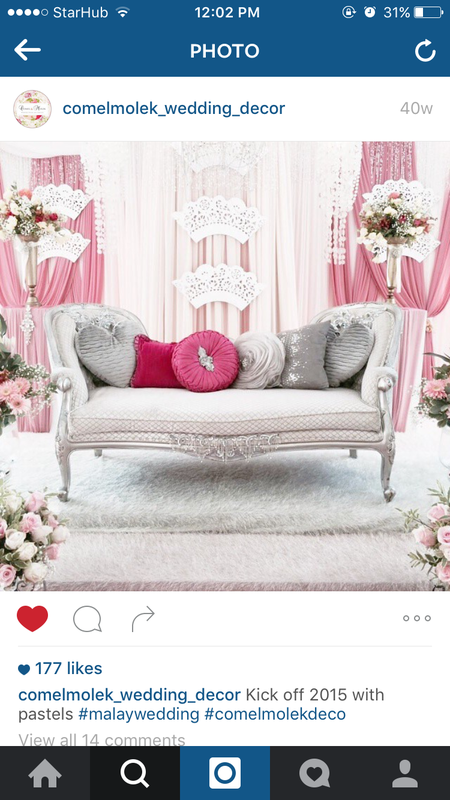 I really think Anggun Decor does a marvellous job when it comes to the dais for weddings held at CCs. Don’t you think so? Now, how comel and molek is this dais? I totally love it. Also, it’s in such a sweet shade of pastel and dusty pink – not too overwhelming. I LOVE pink but I never thought of having a total pink wedding because I thought it would be too much (I’m doing my friends a favour, here! Hehe!). But when I saw this, I was sold. Who says I can’t have my pink wedding with DRAPES? I attended a friend’s wedding and when I saw the dais, I knew in a heartbeat that it was done by ComelMolek. Although they are quite new in the industry, as compared to Jentayu, I think they’ve been doing pretty well even though they are not as active and popular on social media as compared to the other popular vendors. And they have nice drapes to beautify their dais’ backdrop. Their prices have increased since the last time I asked them early this year and I was very shocked but I guess, it is bound to happen anyway! Now, this one, is another one that stole my heart. Z and I first got to know of Eternally Yours when we visited the wedding expo recently. When I saw their very unique platform/stage, I thought to myself, “Wow, this i something different!” Look at how the platform is covered by white flower petals. It adds a touch of class and extravagance to the whole set up, no? Z and I spoke for about half an hour with the manager and she nicely explained to us in detail every package they offer. They also make such exclusive wedding gubahan trays. 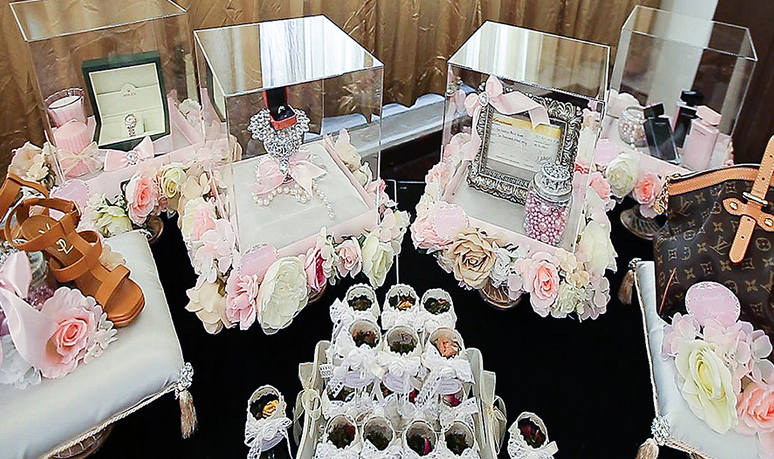 They make use of those clear acrylic boxes which reminds me of those gubahan trays from Malaysian weddings. Come, let me show you an example. Nice right??? Okay maybe the flowers around the trays are a bit much but the ones we saw at Expo were so simple and elegant! So that’s about it. The vendors I’ve shortlisted. Actually, I shortlisted 5 vendors. The last one is RH Bridal but I decided not to include RH Bridal into this post because they have not replied me until now. It’s been more than a month. So, I’m a bit disheartened. But, takpelah. Now, do you understand how this whole decor thing is causing me such distress? They are all so beautiful and elegant, right? Funnily though, I am taking my time with booking the perfect wedding vendor because I do not want to rush it. I want to make sure that I select the right decor company that’s able to fulfil my requirements for drapes, fresh flowers, details and perhaps, an open concept dais? Well, the quest to clinch the right vendor will continue for now! As for now, I’ll be booking 3 heavy weight vendors this week, inshaAllah! We have yet to book our photographer because we wanted to think it through after our appointment last week. But actually, we only took 1 minute after the appointment to think through because after we left, we smiled to each other and I knew, Z was sold. He tried to hide it but I know him too well. Hehe. I’ll update on this once we’ve paid the deposits for the 3 heavy weight vendors (photographer, caterer and bridal).